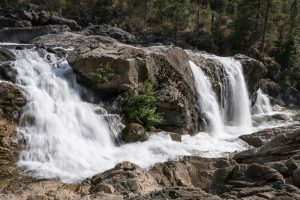 While this hike can be a hot one in the summer, you’ll get to visit two wonderful waterfalls as you explore the north shoreline of the Hetch Hetchy Reservoir. The hike crosses over the O’Shaugnessy Dam and through a tunnel before walking along the north edge of the Hetch Hetchy Reservoir. You get lovely views of the reservoir on your way to the base of Wapama Falls (see Wapama Falls for details). After Wapama Falls, you’ll switchback up the steep granite walls to a shelf with a mix of forest and open areas and wonderful views of the water below. After reaching a nice vantage, the trail descends into the shade of the trees along Tilltill Creek before climbing out into the hot, exposed hillside with low growing shrubs. While a cascade appears just before you enter the trees, Rancheria Falls itself is found by taking a faint trail to the right once inside the lovely stand of trees. This takes you to the base of these complex falls with a wonderful combination of cascades and waterfalls. Head back to the main trail and follow it up further to the bridge over the creek to explore the pools and cascades above the waterfall. Trailhead: Follow the Hetch Hetchy Road to parking at the dam.